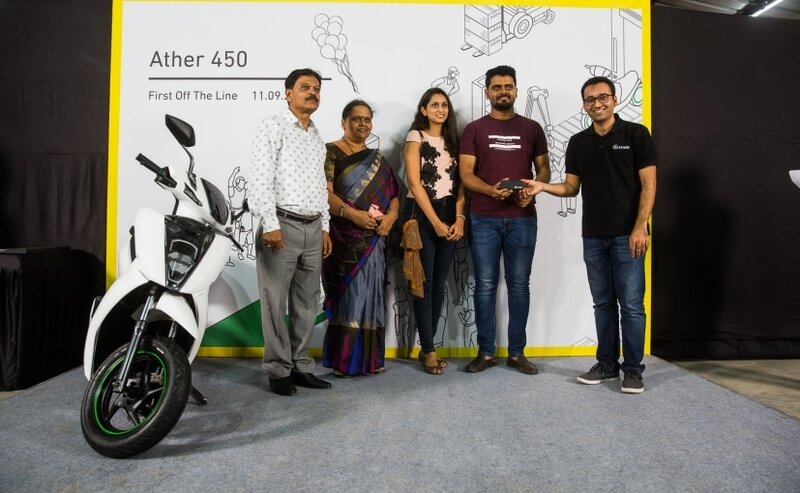 As of now Ather has begun with the delivers of the Ather 450 only in Bengaluru and select few customers were invited to the companys final assembly unit today to take their Ather 450s home. Ather Energy has officially commenced the deliveries of its flagship electric scooter, the Ather 450, in Bengaluru. The electric two-wheeler start-up invited a select few customers to the company's final assembly unit to hand them the keys to their Ather 450 electric scooter. In fact, the company has also set up private charging stations at their residences. Along with the scooter, Ather is also offering its customers with a special subscription plan, Ather One. This comprehensive plan covers data and charging costs both at home and at the multiple fast public chargers set up by Ather across the city. The plan also covers periodic doorstep service of the vehicles and cost of common spare parts. Available in two options - Ather 450 and Ather 340, the new electric scooters were launched in India in June this year. As of now, the company appears to have commenced the deliveries of only the flagship Ather 450 in Bengaluru. Commenting on the commencement of 450 deliveries, Tarun Mehta, Co-founder & CEO, Ather Energy said, "Today, marks the real launch of the company as consumers take their first scooters home and begin to ride them. We will continue to deliver more Ather 450s in batches to the rest of our pre-orders in the coming months. We still have a lot to learn about the final ownership and day to day usage of our vehicles and are looking forward to the next phase of our growth." The Ather electric scooters are available for customers to order, both online or the Ather outlet in Bengaluru city. Pre-bookings for the 340 commenced in April this year, and for the 450 in June, and is claimed to have sold out its inventory for the rest of the year. In fact, Ather says that nearly 60 per cent of its customers are choosing to place orders online. Ather also spoke about its expansion plans starting with Chennai followed by other cities in 2019. The company has already started working on the charging network, AtherGrid in Chennai and expects to set up its experience centre, AtherSpace, in the city by Q2 2019 which will be followed by other cities. The Ather 450 is a smart, futuristic, and feature-loaded electric scooter. On the features front, it comes with a 7-inch Android-based touchscreen display screen with a custom user interface. The system will also offer features like push navigation, over-the-air updates, parking assist system, waterproof charger, multiple riding modes and LED lights. The 450 is powered by a 2.4 kWh lithium-ion battery that comes paired with a BLDC motor which offers peak power of 5.4 kW and continuous power of 3.3 kW with 20.5 Nm of maximum torque. It comes with a top speed of 80 kmph and a range of 75 km on a full charge. It's also one of the quickest in this segment and can do a 0 to 40 kmph sprint in 3.9 seconds. The Ather 340, on the other hand, promises an actual range of 60 km on a single charge, and with a top speed of 70 km. The 1.92 kWh lithium ion battery powers the electric motor which, in turn, propels the Ather 340 with 20 Nm of peak torque, with a claimed acceleration of 0 to 40 kmph in 5.1 seconds. The Ather 450 is priced at at ₹ 1.24 lakh, while the 340 is priced at ₹ 1.09 lakh (on-road, Bengaluru).